A second night within occasional sight of Domme passed quietly. Consciousness returned, encouraged by a dawn chorus, at about 7:00 AM. 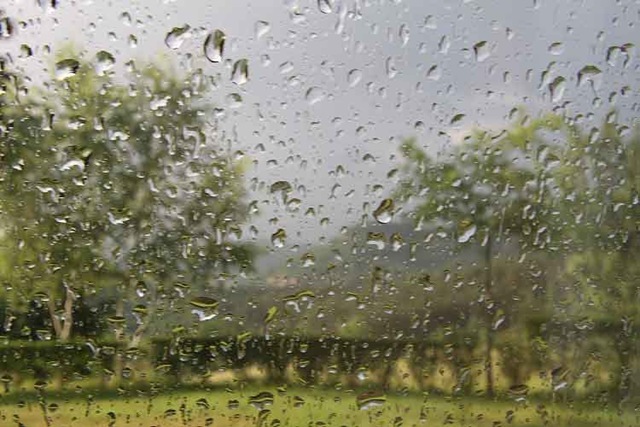 The rain returned, drowning out the dawn chorus, at about 7:40 AM. So much for yesterday’s Aujourd’hui. Waterproofs and umbrellas at the ready, we popped into Cénac, the local small town, to visit their market and get some breakfast. Breakfast called for something slightly indulgent to cheer us up. Unlike the weather, a couple of pain au raisin did not let us down; they were superb. From the market, we picked up some asparagus to grill for lunch and a duck breast for dinner, too. 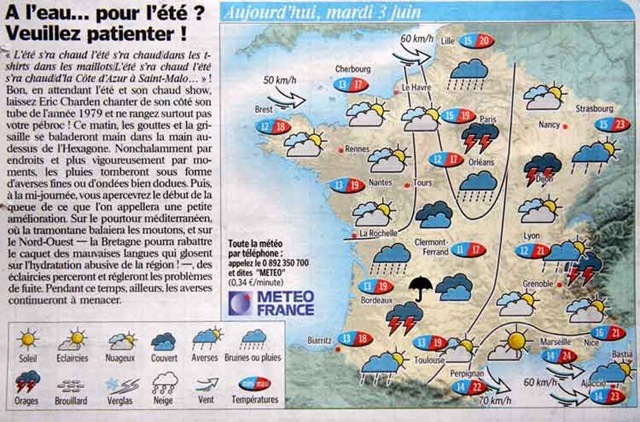 A new Aujourd’hui showed that good ol’ Météo France had changed its mind about today’s forecast. Now, our little umbrella (black, this time, for more contrast against the light ground) was wedged firmly between a variety of bad news: couvert (solid grey yuk), bruines ou pluies (drizzle or rain) and orages (storms). Fine choice! Actually, we’d happily have taken the couvert, given the chance. Anything that didn’t involve rain. Regrettably, the reality seemed to be more a mixture of bruines ou pluies. This is getting tiresome, now. Last year we had the most "unsettled" weather that we’d ever had in France in the 25 years that we’ve been coming. It wasn’t so bad, however, that it kept us inside for days. This year has got it capped. "Unsettled" is a strange term to apply to bad weather. This was very settled – into almost constant rain. I have never seen weather anything like this in France. On a lighter note, Carol was wandering around the more wooded part of the campsite and discovered an absolute treasure trove of orchids. 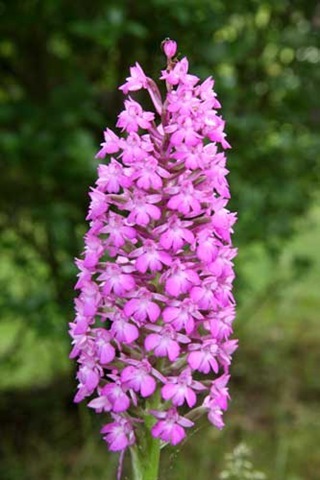 We are familiar with the pyramid orchid which grows at home on the Cotswolds. Here, we have a couple of beauties which, according to our books, do grow in England but which we have never seen. 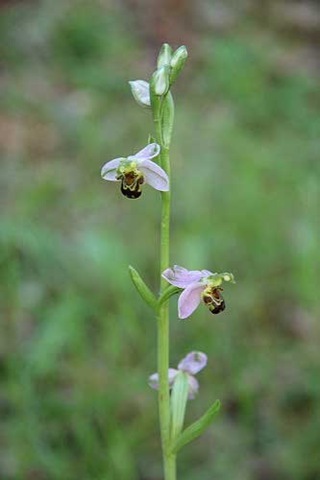 There were one or two examples of the bee orchid, a relatively small but perfectly formed individual bloom orchid. 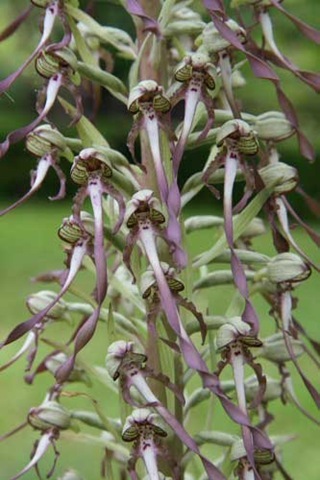 There were also many large spikes of the bizarrely shaped lizard orchid. What wonderful orchids and what dreadful weather (what’s “pebroc” (in weather forecast) in English?). Despite what you may think, the weather here is worse. People opposite flooded first time ever and I am rather fretful. Roll on more orchids and less weather! !